Welcome back to our March 2009 issue 10 of Bangkok Travelbug, the monthly newsletter of Tour Bangkok Legacies. Here’s a special welcome to those who just joined us this month. Welcome to the Travelbug community of friends. This month, we’re going to take you across the Chao Phraya to see the other side of Bangkok which is also the older side. Just sit back and relax. Here are the comments from a reader who first wrote to us in November 2008. I’m grateful for his loyal readership. Your write-ups on the events in February provide excellent details and interesting glimpses of the history behind each of the events. The photographs and details of the different food make one's mouth water. I assume the barbecued pork in Bangkok is no-where near Singapore's price of $40 per kg. Your interactive maps are far superior and interesting than the old ones. A great improvement! Keep it up. Thank you all our loyal readers for your continuous support for Bangkok Travelbug. I’ve started a hotel finder page that allows readers to locate and book hotels world-wide. Over the last few months, I’ve noticed that some readers book hotels in other parts of Thailand and the rest of the world through this website. I’m grateful for this. So I’ve consolidated all the links into one page for your convenience, the hotel finder to book hotels world-wide. What I really enjoyed about preparing this page was to see the beautiful pictures around the world submitted by several of you. These were scenes from your countries of residence or from your holidays. This one’s my favourite. In the words of Bill who submitted it, “God’s own country”. Indeed it is, close to paradise. Makes me wish I could fly to these far-away places to see them for myself. My sincere thanks go to these readers who have contributed in making this page more attractive than it would otherwise have been. Take a look at their pictures. This month, let me take you across the Chao Phraya to the Thonburi side of Bangkok. According to the maps of Western traders to Ayutthaya in the 17th century, there was a village called Bancok or “village of wild plums”. It was originally located at the base of a sharp meander in the Chao Phraya River. In 1542, a canal was cut across the base of the meander to shorten the sailing time to Ayutthaya. 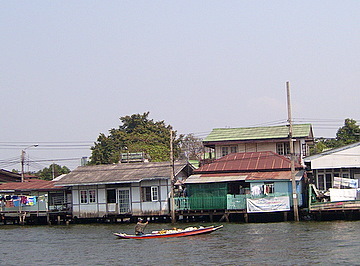 After time, the canal became the main course of the Chao Phraya. This placed the village on the west bank of the new course of the river. 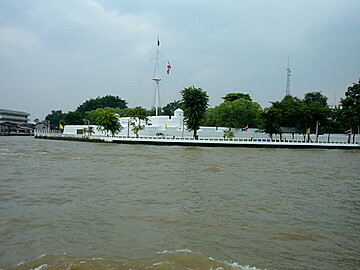 A small port with customs and immigration stations was set up here for ships sailing to Ayutthaya. After a long sea journey, traders took a rest here before continuing on to Ayutthaya. With the shortened sailing time to Ayutthaya, the risk of attack by hostile powers increased. To counter this threat, a forward defense layer was created near Bancok. 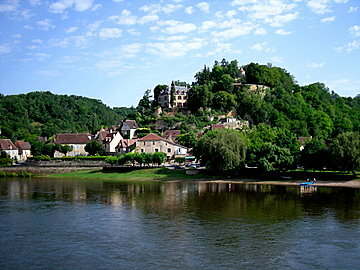 Two forts were built; one near the port on the west bank, another was located across the river on the east bank. The port acquired the status of a fortified city called Thonburi. However, an old French map in 1693 still referred to the city as “Bancok” long before the founding of the Bangkok as we know it today. After the fall of Ayutthaya in 1767, King Taksin established the new capital in Thonburi, which was the capital until 1782 when Bangkok took its place. Thonburi remained a separate province until 1972 when it merged with the modern city of Bangkok. With that merger, Bangkok Noi, a district in Thonburi, became a part of Bangkok. That is where our journey begins. I first visited Bangkok Noi on the Thonburi bank of the Chao Phraya in early 2005 to look up the Bangkok Noi Museum a community museum in the Suvarnaram Witthayakom School. The museum preserves the history, culture and way of life of the people in that community in the days gone by. This visit sparked off an interest in a side of Bangkok rarely seen by most visitors who tend to concentrate on the east bank where the main city is located. To think that these communities have been around long before Bangkok became the capital. Compared to other museums in Bangkok, these community museums are modest in their displays owing to lack of funds. They lack the high tech gadgetry of the newer museums. But what’s important is that they preserve a way of life and the cultural heritage of the community that’s fast disappearing. The simple displays of maps, old photos and models are a wealth of information. 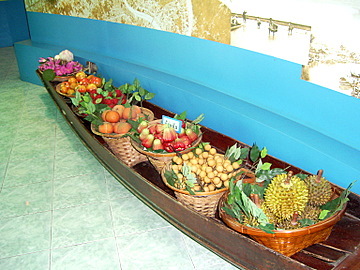 The area called Bang Khun Non is renowned for its variety of fresh fruits. 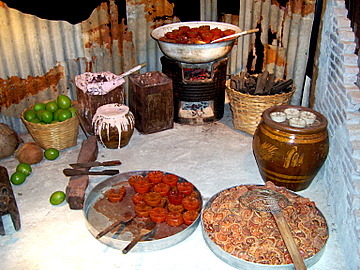 The community is also remembered for its cakes and other delicacies. Another speciality of the community is traditional craftsmanship which brings us to the next subject. During that first visit I met a young man who was the administrator of the museum. He offered to take me during his lunch break to Ban Bu, an old community near the school. There’s a shop there making bronze bowls that are products of an ancient craft. We walked along narrow winding lanes to arrive at the Jiam Sang Sajja bronze factory. I could never have found that place on my own. I am grateful to that young man for his enthusiasm in promoting the traditional arts. I was looking forward to meeting him again during my second visit to the museum on 4 February 2009. But he has left the museum and another person has taken his place. Many things have happened since that first visit. 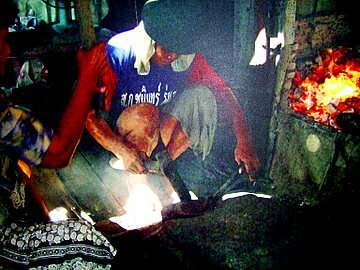 The bronzeware shop and several houses in Ban Bu were burnt down in early 2006. They have rebuilt the community and the shop is now reopened. That’s going to be our next stop. 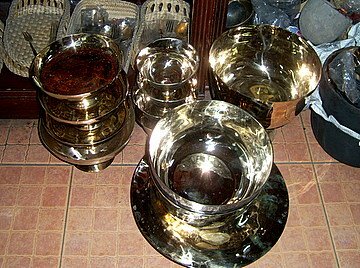 Thai bronzeware or khan long hin (stone polished bowls) is the product of an ancient skill passed down through the generations since the Ayutthaya days. The basic steps in making these bowls remain the same. The only change is the introduction of electrical grinders and polishers. Six steps are required to produce the final product. The only step that hasn’t changed is the first; heating of the alloy and beating it into shape, a hot and tiring process. 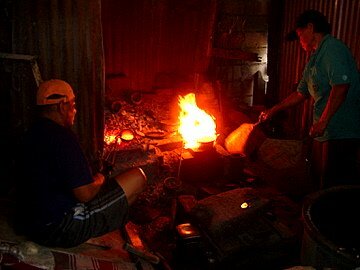 Two people sit by the fire and alternately heat and beat the metal into shape. The bowl then goes through various stages of grinding and polishing to give us this. These are some of the old treasures you’ll discover in Thonburi, the other side of Bangkok. For the details of this craft that’s centuries old, please see Thai bronzeware. We continue in Thonburi to visit the Taling Chan floating market. See you then. If you enjoyed reading this e-zine, please forward it to a friend. If you received this from a friend and found it interesting, please subscribe at, Bangkok Travelbug. We’d love to hear from you. Please tell us what you think, e-mail-us.